The Markilux 8500 is the awning for conservatories with uneven, bevelled, indented or hipped roofs. Unlike other awnings with guide rails on the edges of the cover, the Markilux 8500 has indented guide rails in the centre allowing for no contact with the edges of the conservatory to allow for creative designs. The guide rails can overhang the outermost bracket by up to 1m giving more protection from the sun and ensuring your conservatory is fully shaded. The awning material offers exterior solar shading – this allows the light of the sun to light your conservatory whilst blocking out the uncomfortable heat. It uses tear-resistant belts combined with belt guide rollers to ensure quiet and smooth operation and minimises the level of maintenance required. Practically speaking, the Markilux 8500 offers the same advantage as the Markilux 8000. With its indented guide tracks, it makes fitting the awning to conservatories with bevel-shaped roofs and other non-typical shaped roofs achievable with ease. 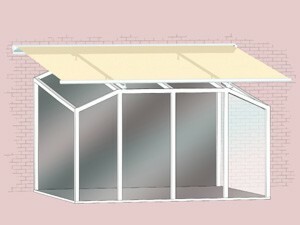 A single awning can shade an area of up to 25m². The tracks can be indented up to a maximum of 120cm and the guide tracks can extend 100cm past the last support bracket. Wall sealing profile to cover the gap between the awning and the wall. An easily installed, radio control sun and wind sensor guarentees comfort and a degree of protection – even in your absence!